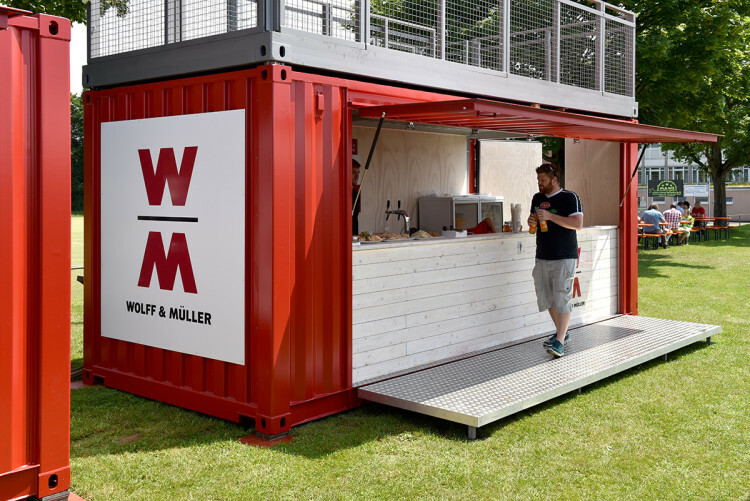 This bar container was designed and built for the construction company Wolff & Müller, under commission from Agentur Floor Seven GmbH. The event containers’ compact construction means they can be optimally used at different event sites. A special feature is the foldable, covered terrace space, which can effortlessly be pulled out or put away. The built-in bar offers all the necessary features for a faultless serving of the guests: beverage dispenser with integrated cooling, ice machine, further cooling appliances and an ideal storage space. Attachable rooftop terraces for the container allows for an ideal viewing of the event. These containers and their multiple features enable a public appearance with a unique corporate identity and branding and therefore are the perfect alternative to the conventional beer wagons.